Three buildings collapsed and another was damaged during a massive fire in Portsmouth, New Hampshire, Monday morning. Portsmouth's fire chief says a blaze that destroyed a restaurant and spread to a neighboring building probably could have prevented if sprinklers had been installed. Seacoast Online reports that Fire Chief Steve Achilles told the City Council Monday night that the five-alarm blaze prompted him and others to review changing the city's building codes. The fire earlier this month spread from the three-story building that housed the State Street Saloon to a neighboring building that houses several apartments. All 17 people who live in the buildings are accounted for, and no one was injured. 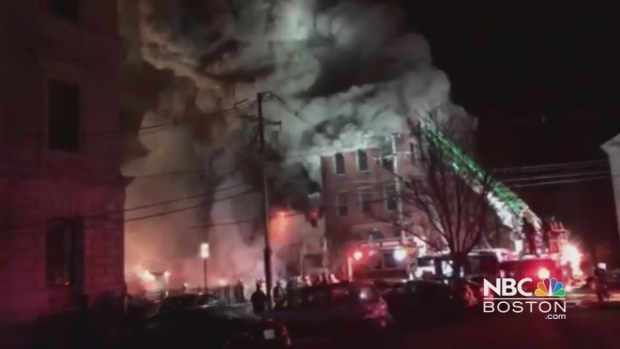 Michael Hagerty captured this video of multiple buildings collapsing during a massive fire at the State Street Saloon in Portsmouth, New Hampshire. Achilles says that Portsmouth's ordinances are based on the state fire code, which didn't require that the State Street Saloon building have sprinklers.